A Doctor's Life: Why so long to see? Why so long to see? 2. Doctors know nothing compared to what I read on Facebook. So just give the prescriptions that I want. 3. Everything a doctor does is wrong but whatever wrong alternative healers do is fate. 4. I just want an MC. Then, there is another group. The I DON'T KNOW WHAT EMERGENCY IS group. Personally, I have a feeling that this may be the work of some trollers online. But I wouldn't be surprised if it was true account as well. Kamon lah, you already know the reason why you have to wait so long. You already know that there were NINE red zone cases in a span of THREE HOURS! That's quite a record. 1. 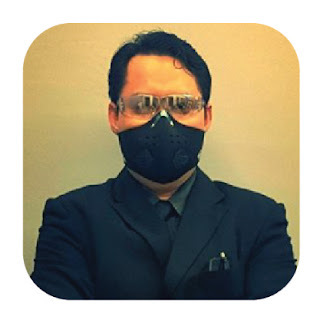 Wait in line for the doctors to see a person with a day history of fever and skin rashes. 2. Be seen and managed by just ONE doctor who also happened to see EIGHT other cases at the same time. 3. I want the best treatment possible and be seen as quickly as possible to make sure I survive. Ahh...I see you answered option ONE. Syabas! Treat others the way you want to be treated right? 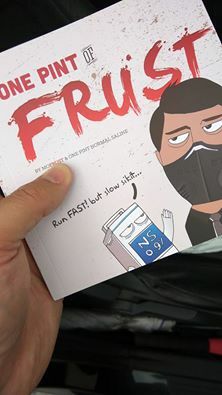 Buat apa I nak kisah pasal orang lain yang nak mati. 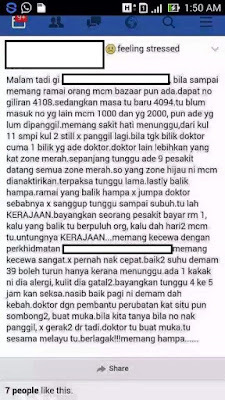 I gatal badan ni pun macam nak mati tau?! Another thing yang tak tahan is the SATU RINGGIT part. Do you think the government makes any money by charging ONE RINGGIT? Do you know how much subsidy is pumped in to the Malaysian healthcare system? Next time, try and see how much you have to pay at the pharmacy to buy a pack of paracetamol and a bottle of benadryl. Ah, not forgetting the cost of X ray, blood investigations....and before I forget; THE CONSULTATION FEES. 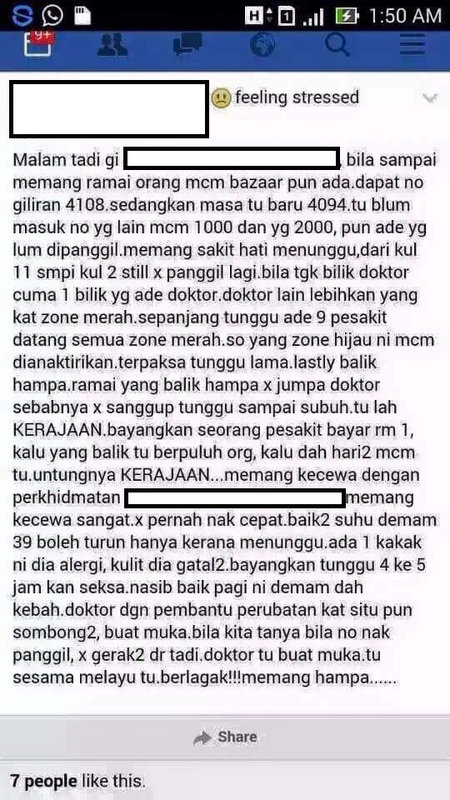 Oh lupa pulak, everyone thinks doctors work for free. Please lah don't be like this. EMERGENCY departments are for EMERGENCIES ONLY. 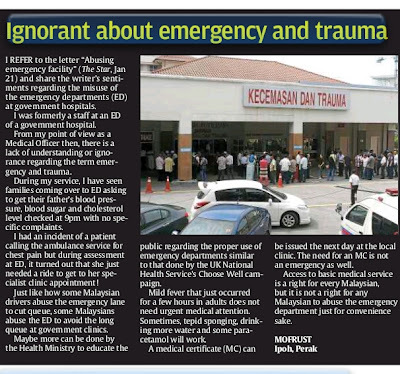 We do see non emergency cases at the emergency department but please let the staff prioritize on the emergency ones. If you happen to have some mild ailments there are other options available. Most of these clinics are managed by assistant medical officers (MA, dressar or whatever you want to call them). You can be assessed here. If it is necessary, the AMO will refer you to the nearest health facility. However, they are not equipped with antibiotics or advanced investigations. It's opened from 8 a.m to 5 p.m. on weekdays. Certain clinics will have extended hours, opening up to 10 p.m. at night. Do check with nearest Pejabat Kesihatan for this information. For a bit more money, you can visit the general practitioners (GPs) or private hospitals. You might not have to wait as long as in government clinic. So please. Try to understand things thoroughly. Don't get emotional and politicize things. Don't get all racial with issues like this. If you can't understand then, try and submit an official complaint with the hospital director. The authorities will get in touch with you and explain what happened. If there are things that can be improved they will try to implement it. Here's one interesting scenario if homeopathy practitioners can have their own ED center. Have to be patient in dealing with all this rubbish. People need to more alert and know *what emergency are* .